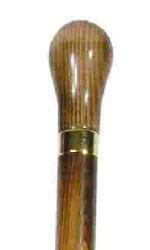 A smart, natural tan wood coloured hardwood tippling stick with an elegant knob handle. The handle unscrews to reveal a glass flask with stopper hidden inside the shaft of the stick. Fitted with a metal ferrule and smart metal collar. This cane is suitable for use as an accessory on formal occasions, but should not be used for everyday support.